Ever stand in your kitchen and think, “Who in the world came up with this plan? A man must have designed it.” I’ve heard it. And I’ve heard it more than once – a lot more. Usually it’s the wife who says it as she’s looking at me out of the corner of her eye. You can just see the thought bubble above her head: ‘and here’s another man who’s going to screw up my new kitchen too.’ I use to feel a little offended by the comment. But I’ve come to learn that what they really mean is, ‘My kitchen was designed by someone who doesn’t know about cooking and never asked me what I want,’ and they’re probably right. Typically this comes up in a home where the kitchen was designed by the architect as part of drawings for the entire house; then the homebuilder took the blueprints to a cabinet supplier and said, ‘Give me this.’ The cabinet supplier sold what was on the page, and no one gave any thought as to either the ergonomics of cooking or the unique way in which that particular homeowner would work in the space – it’s got a sink, stove and fridge, what else could it need? Now I am not slamming architects or homebuilders. Architects are highly educated, well-trained professionals, and there is no way I could do what they do. They have to be concerned with a lot more than a kitchen designer does. But, in general, the architect is more concerned with structural integrity and flow of the house as a whole, rather than the specialized functions of a single room. I also have much respect for homebuilders. They shouldn’t be held responsible for poor design choices either – their main function is to translate what’s on the blueprint into a real, live house. So who’s to blame? Personally, I think the blame should fall to the guy who sold the cabinets to the homebuilder. 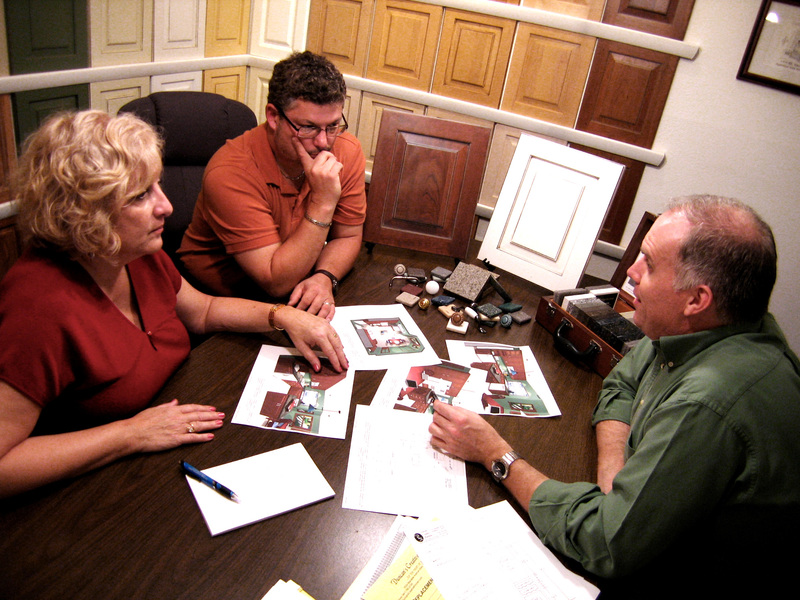 Too many times the primary concern isn’t ensuring a functional, attractive kitchen – the cabinet seller’s main concern becomes closing the sale. There’s nothing wrong with closing the sale. In fact, I quite like it when I close a sale. (I think my credit card issuers like it even more). The problem is when the cabinet seller decides that closing a sale is the only thing to be concerned with. 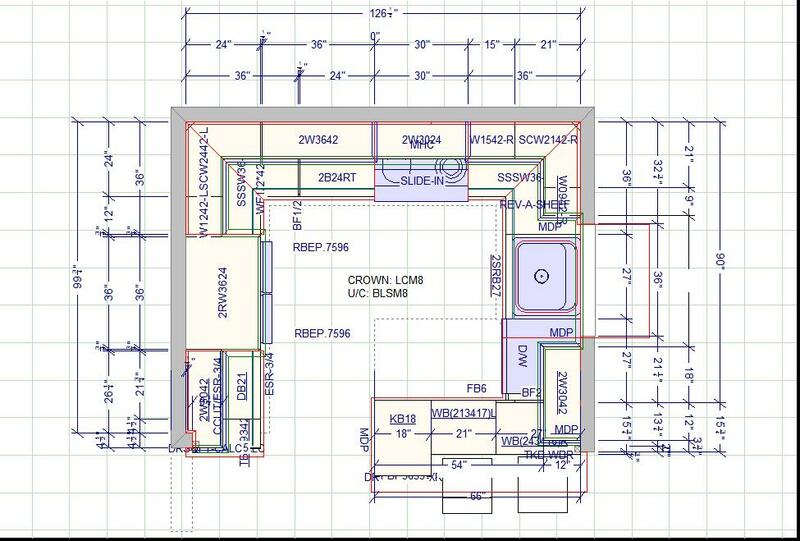 I’ve never had a client walk in with blueprints where I haven’t offered suggestions in the kitchen. Most of the time, the suggestions are well-received, but not always. I remember one client who had a particularly poor layout – it was obviously done by someone whose forte was not residential design. Without much research into the clients’ needs, I haughtily laid out the pitfalls of the architect’s design with the most pompous attitude that I could muster. I was quite full of myself because the architect hadn’t considered the very basic ergonomics of a user-friendly kitchen, and I knew I could improve the functionality of this space. The problem was that the architect I had just demeaned was the son of the potential client. Needless to say, my stuffed shirt was quickly deflated, and the client chose another kitchen specialist. Was I the man in this situation? You betcha – because I hadn’t properly researched what was important to this particular client. Bad design or not, no one wants to hear you say that you think that you’re smarter than their husband/son/sister/mother/etc. The only thing that was important to this client was getting what her son had designed. Could I have convinced her to improve the design with a different approach? Possibly, but I’ll never know because I didn’t ask the right questions to start with. It just goes to show, no matter how good the intentions are, sometimes we all end up being the man. This entry was posted in Design and tagged kitchen design. Bookmark the permalink.